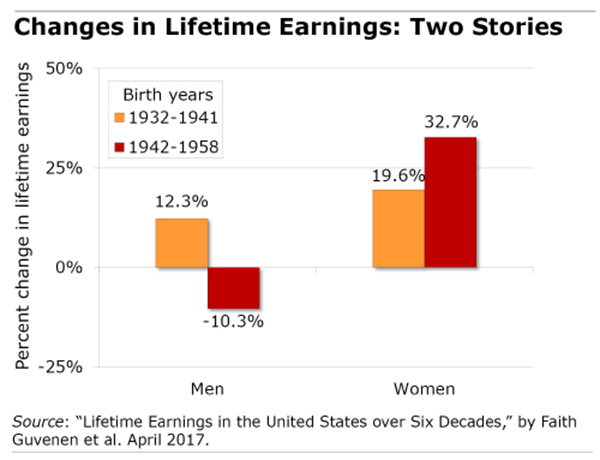 In contrast, lifetime earnings for women born over the same 27-year period enjoyed “steady” and “broad-based” gains of 20 percent and 30 percent over the two sub-periods. The big beneficiaries were middle-boomers, who joined the vanguard of women pouring into the labor force. Their lifetime earnings were higher than previous generations of women, because boomer women worked more. Today, women make up half of all U.S. workers. 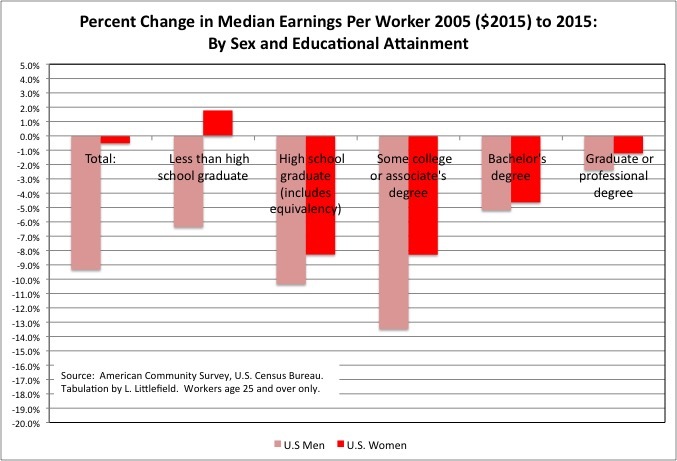 But boomer women’s earnings also increased because they devoted more time and effort to college and careers, which increased their earnings potential. Over this time period, it’s also true that employer spending on workers’ health and retirement benefits was increasing, the researchers said. Adding the value of these benefits to male workers’ compensation improves the picture but “does not overturn the conclusions” that men’s lifetime earnings have declined. However, the gains for women were just catch up due to previously lower educational attainment and labor force participation and discrimination. With those factors no longer relevant, average pay for women is now falling too, and has been for some time.. Yes, but women have done far better in the current generation compared to their moms, 44% of whom were home bodies. See this research summary.